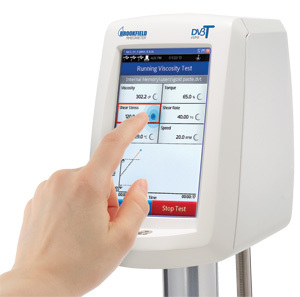 A modern 5-inch color touch screen guides DV2T users through test creation and data gathering analysis for fast and easy viscosity measurements. The DV2T also offers new programming capabilities and results analysis including data averaging and QC limits with alarms. User instructions with multistep protocols can be created on PC based software and uploaded to the DV2T through a USB Flash Drive. Test data can be printed directly on a local printer or sent to a PC. The new interface also provides customizable user levels with password access for compliance with regulatory requirements such as 21 CFR Part 11. Automated program control by PC running (optional) RheocalcT software; speed control from 0.01 to 200 rpm. Complete with appropriate spindles, PG Flash Software, RTD Temperature Probe, viscometer stand, guard leg, and carrying case. Print-out - The RS 232 serial output also allows direct connection to the printer, which can, either continuously or on-demand, print out fully formatted and labelled data on all parameters. 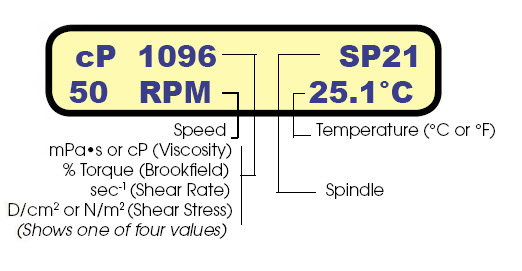 Recording - The Brookfield Thermosel System with DV-II+Pro produces a visual profile of a material's viscosity and temperature behavior on the strip chart recorder. User-friendly Operation - Operational modes are easily selected by keyboard and displayed on the bright 2-line LCD. PG Flash Software - Program generator software for customizing test criteria for routine product QC PG Flash allows you to create repeatable custom tests on your PC! Once the program (up to 25 steps) is created, it can be downloaded to a supplied USB flash drive and then uploaded to any DV2T Viscometer. 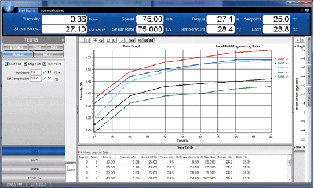 RheocalcT Software (Optional) - Get total control of your instrument and test parameters Automatically control and collect data with Rheocalc and a dedicated computer. Optional Accessories - Click here to view full information. Also available with EZ-Lock Option, Ball bearing Suspension (RV/HA/HB Models) - Call for pricing. Must be ordered with Viscometer. Cannot purchase separately. The "EXTRA" combines versatile viscosity testing capabilities with a durable ball-bearing suspension system and FREE Rheocalc T Software. 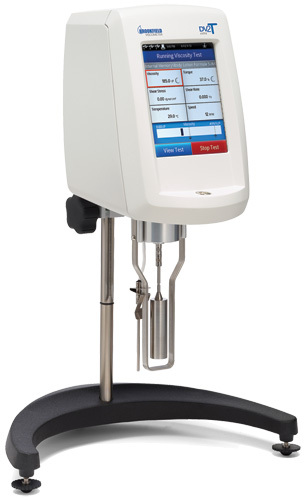 Quick Action Lab Stand easily moves the viscometer up and down with a press of a button. 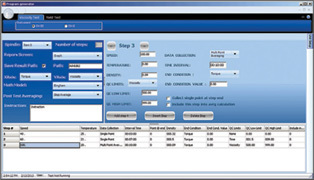 Allows for quick positioning and rapid sample changes for better efficiency. EZ-Lock Spindle Coupling Quickly attach and remove spindles in two simple steps. 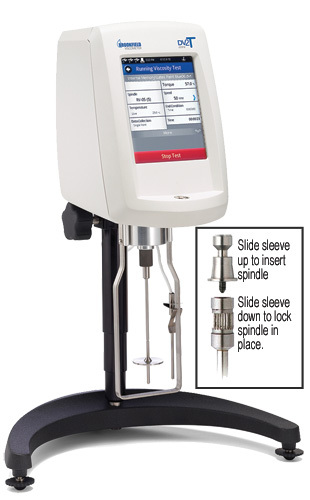 Protect your viscometer against damage that can occur from frequent spindle changes or from multiple users. † 1 cP achieved with UL Adapter accessory. 15 cP on LV with standard spindles. †† Minimum viscosity is achieved with optional RV/HA/HB-1 spindle.